Each inhabitant who reflects on video surveillance systems, imagines some difficult construction consisting of tens of cameras, hundreds meters of wires, a dark location with monitors in some rows. Such system approaches for banks, a casino or other similar institutions, but is absolutely not suitable for usage at small offices or at home. 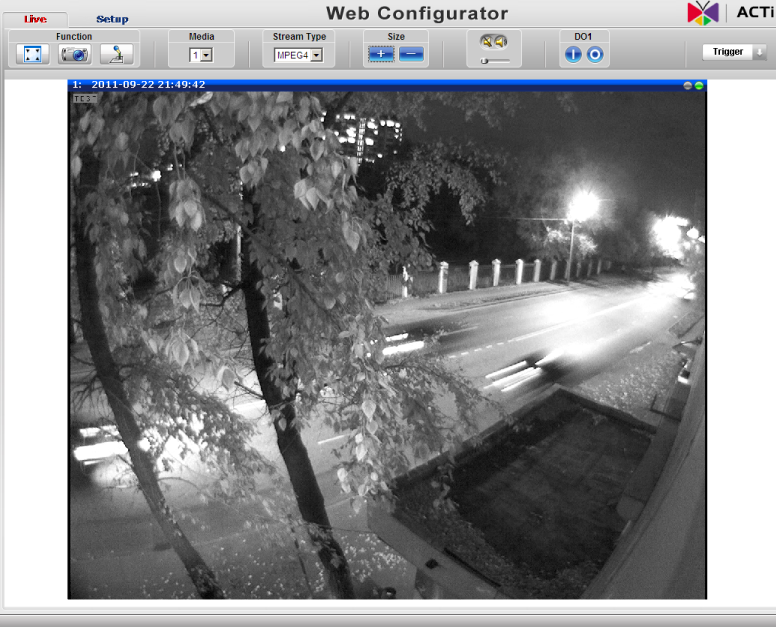 Fortunately, the modern cameras have the Ethernet-interface, and to be connected to them it is possible by means of the normal browser. 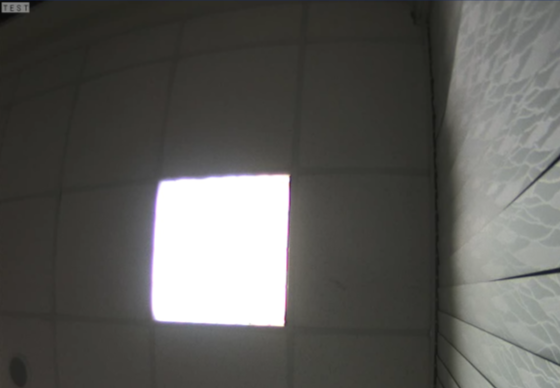 One of such IP-cameras is ACTi TCM-5611 - today in our laboratory. Outwardly ACTi TCM-5611 differs nothing from traditional cameras for video surveillance and is performed in a two-colored metal case. The lens is replaceable. You can set it in by twisting into a threaded ring on the case front panel. On the camera bottom is tightened the special platform, which allows mounting the device under a ceiling or on a wall. 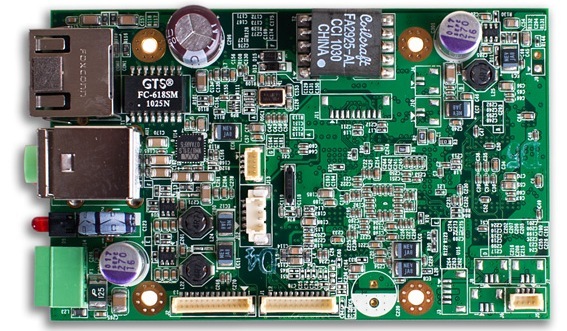 There are a DC Iris connector with four contacts for diaphragm electronic control and manufacturer's title on the side surface of TCM-5611. 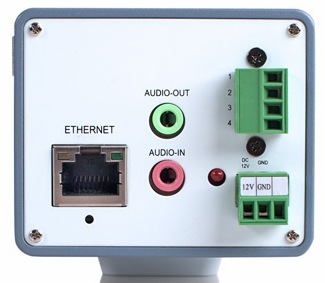 There are connectors for power connection, and also digital input and output on the back panel. Also there is Power LED light, connector for Ethernet, audio input and output, and also recessed 'Reset' button for resetting user configuration to defaults. Let's look into the device. 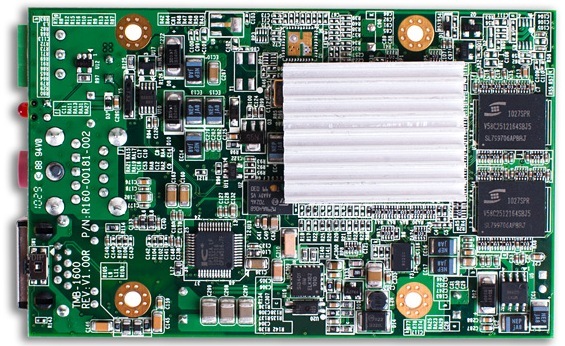 All electronic stuffing consists of three double-sided boards two of which have approximately identical sizes. On one of them there is a sensor closed by the interchangeable filter with the electric drive. 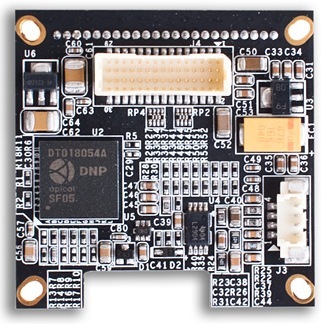 Chip DNP DT018054A allocated on the second board is engaged in image processing received from the sensor. The CPLD Lattice LC4032V is allocated here, too. 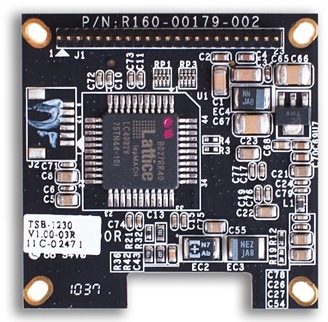 On the host board the greatest chip is ACTi ASOC3100E. Unfortunately, it is impossible to receive any information about it. 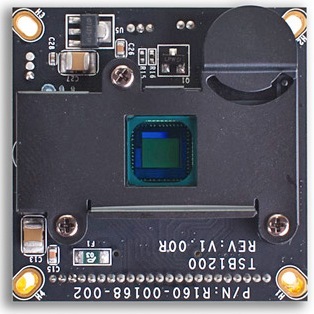 The RAM is presented by two ProMOS V58C2512164SBJ5 chips, the volume of each of which is 64 Mbyte, so the total volume of camera RAM is 128 Mbyte. The flash-memory is presented by STMicroelectronics unit M29W640GB with volume of 8 Mbyte. For network support responds IC+ chip IP101A-LF. It worthy to tell about replaceable PLEN-0203 lens with which you can replace the standard lens. 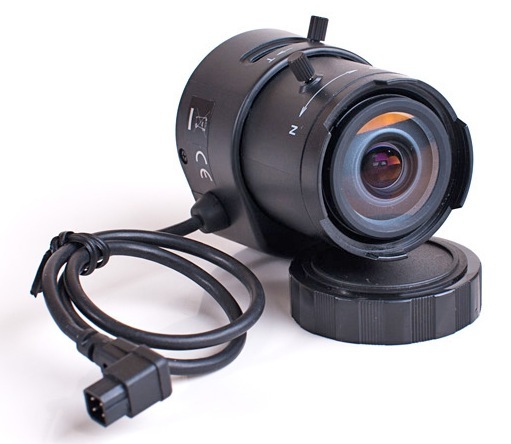 PLEN-0203 has changeable focal length from 3.1 to 8 mm, a view angle from 34.12 to 85.91 degrees and 1.2 aperture. 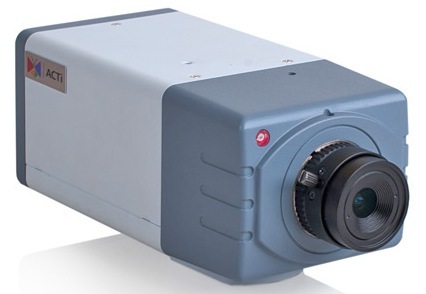 Hardware platform review is completed, now we can consider program features of ACTi TCM-5611 camera. Before firmware upgrade, please check up new versions of microcode support on vendor's website. 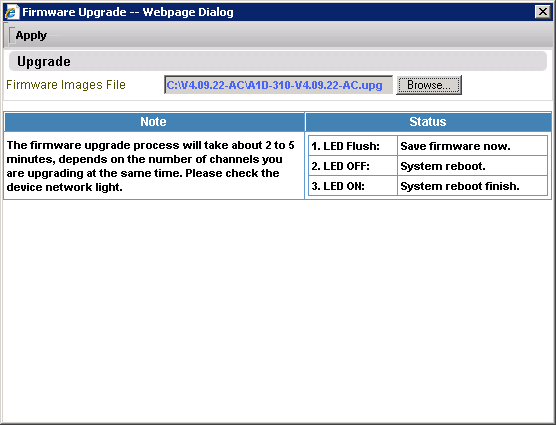 You can install the current firmware version by 'System Information' item of System group of the camera web interface. 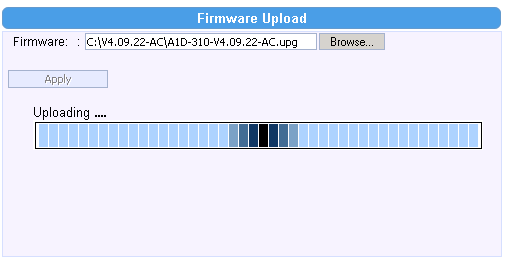 'Firmware upload' item of the same group is designed for firmware uploading. You only need to select an archive file with update and click 'Apply' button. It takes about three minutes to update. After firmware update it may be need to update profile containing various parameters of camera operation. You can change profile by 'Profile loading' item of System group. 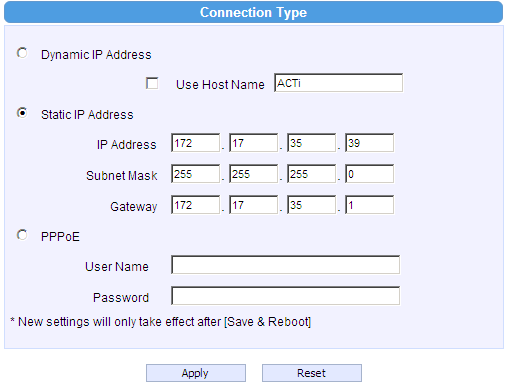 Firmware update can be made either through web interface as well as by ACTi IP Utility. 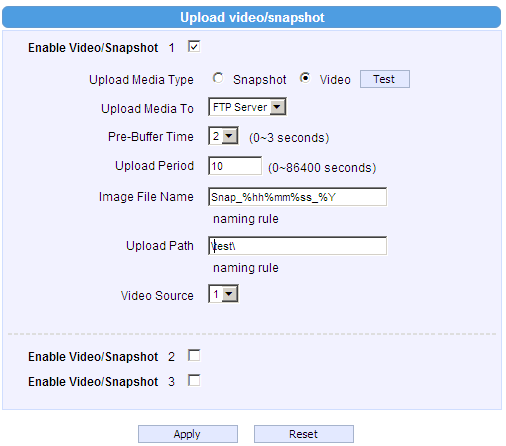 For that it is required to detect the camera in a local segment then click 'Firmware Upgrade' button. Update by the utility takes as much time as through the web interface. Connection to the camera possible only by Internet Explorer versions 6.0 or newer (32-bit versions only). 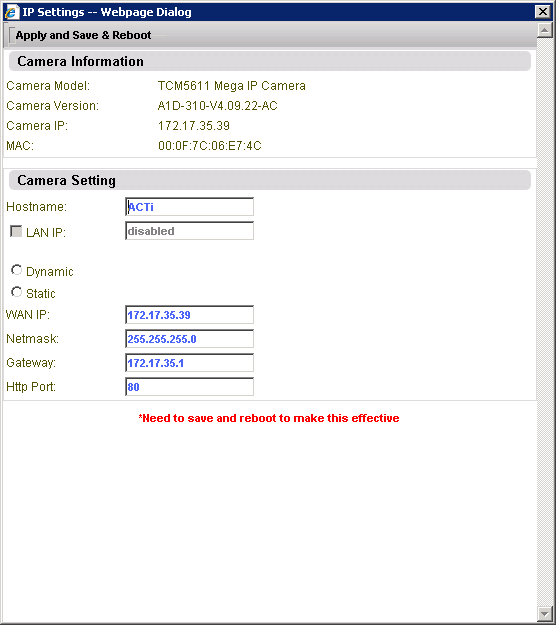 If there is DHCP-server at a network segment with installed TCM-5611 then the camera gets its IP address from DHCP-server. 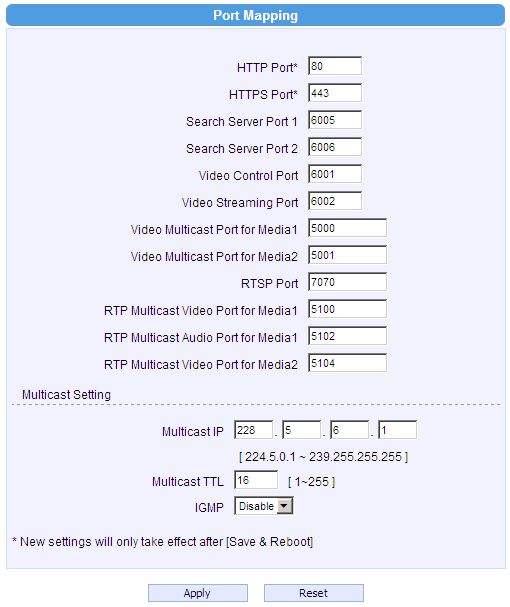 If there is no DHCP-server then TCM-5611 uses IP address by default – 192.168.0.100. 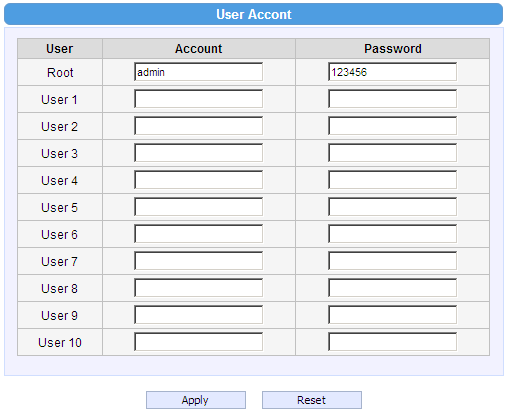 Before initiating control it is required to install an Explorer add-on nvEPLMedia.ocx then enter login and password which are Admin and 123456, accordingly by default. 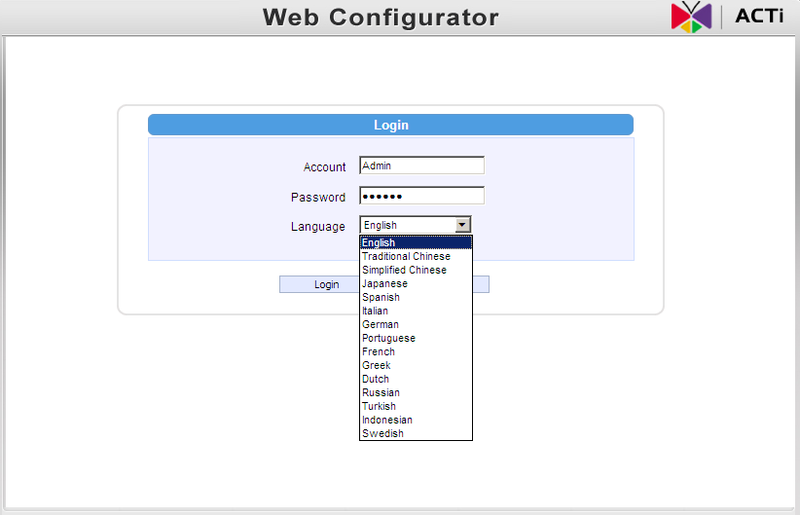 The web interface is available in fifteen languages: English, traditional and simplified Chinese, Japanese, Spanish, Italian, German, Portuguese, French, Greek, Dutch, Russian, Turkish, Indonesian and Swedish. 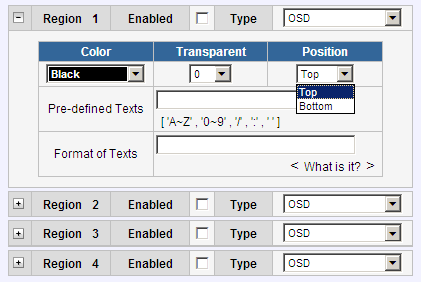 'Setting' tab allows the manager to configure key parameters of the camera. Let's consider them in details. The menu at the left contains three items (Host, Date and time and Quit) and five groups (Network, IP settings, Video and Audio, Events, System). 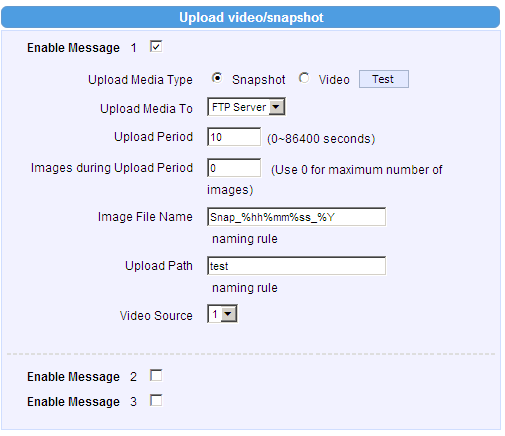 'Host' item is designed for a choice of device's web interface language as well as for a name of the camera and a host. 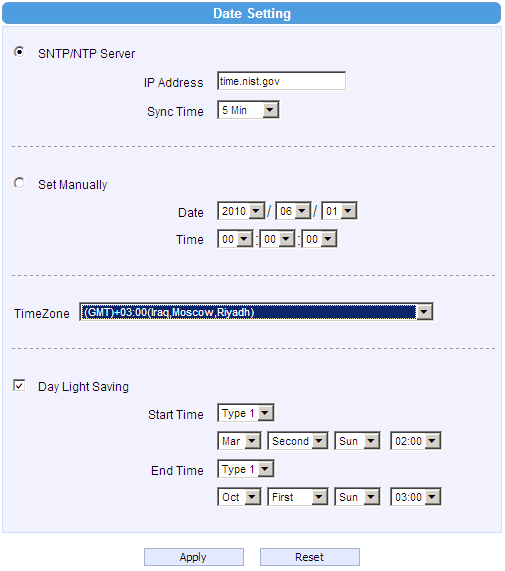 ACTi TCM-5611 can use locally set time, or be synchronized with the external NTP-server. Appropriate adjustment is available in 'Date and time'. 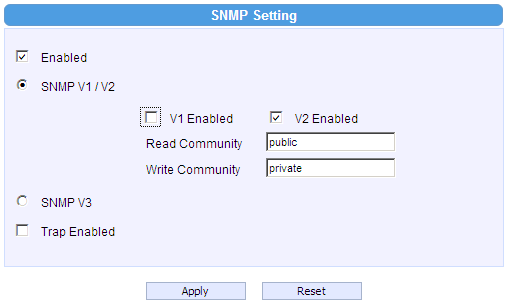 Items of 'Network' group are intended for access restriction to the camera by IP addresses; pointing of ports on which some services are available; selection of a service type, the permission/allowing or blocking of UPnP, SNMP, Bonjour and 802.1x protocols, RTP protocol control, and also a choice of a speed and duplex of Fast Ethernet port. 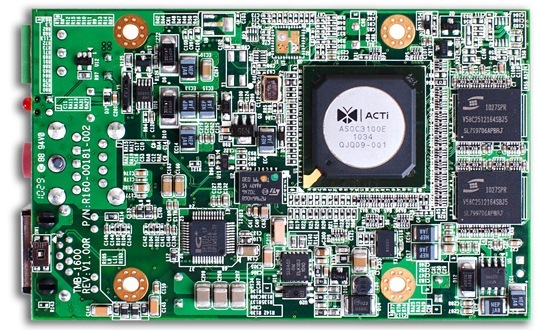 ACTi TCM-5611 can be installed not only in a corporate or home network but also it could have its own independent connection to the ISP. 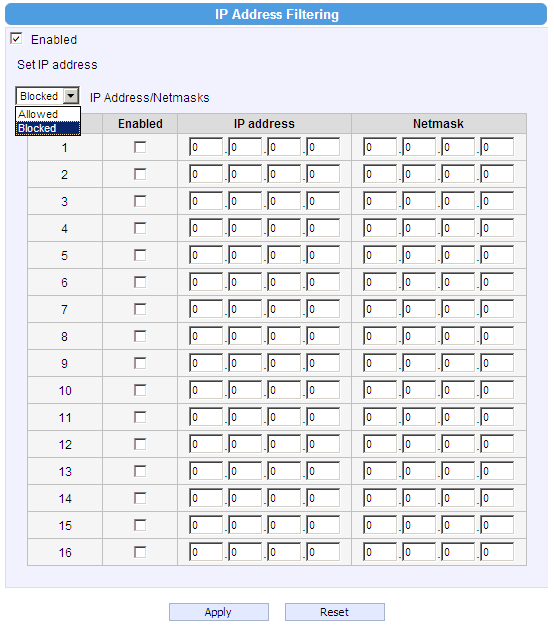 All configurations of such connection are made by sub-items of 'IP Settings' group. 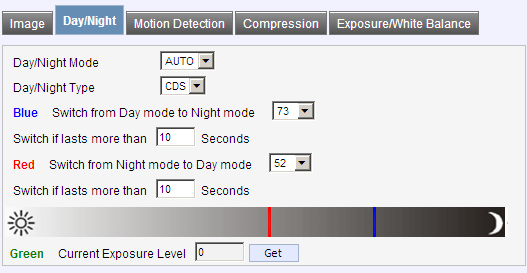 You can manage settings of brightness and contrast, white balance and saturation, sharpness and compression, parameters of day and night modes detection, motion detections, and also volume control of an audio-output and inscriptions superimposed on the image by the sub-items of 'Video and Audio' group. 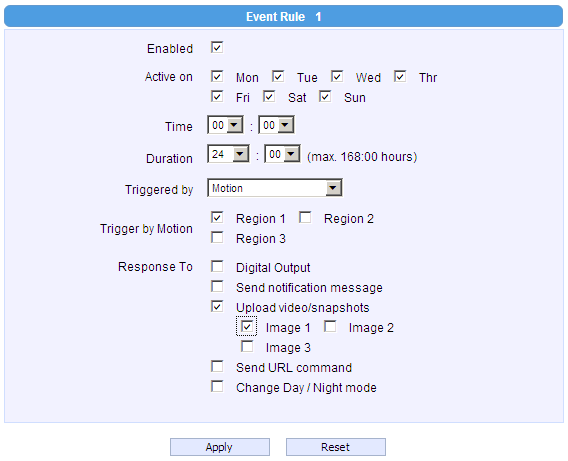 Sub-items of 'Event' group are intended to control camera response on any events around. When the certain situation happens, the TCM-5611 can address to servers on FTP, SMTP and HTTP protocols to send the notifying message, URL-command, image or video loading. So, for example, at motion detection in a certain zone the tested IP-camera can send the message via e-mail in to the Security Department or record a video clip and save it on FTP-server. The last group for overview is 'System'. Sub-items of 'System' group allow configuring up to ten users, to view the information on system, to reset to factory default settings, to upload firmware and a profile, to reboot the camera. While in service TCM-5611 there was detected the insignificant error in the web interface, hindering access to the lower menu at deployment of large number of groups. 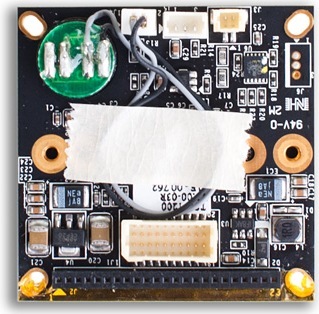 ACTi IP Utility is intended for camera detection in a local segment, corrections its IP-parameters (if needed), obtaining of additional convergence on operation of the device, firmware and profiles upgrade and also configuration saving and recovery. Let's go now to testing section. 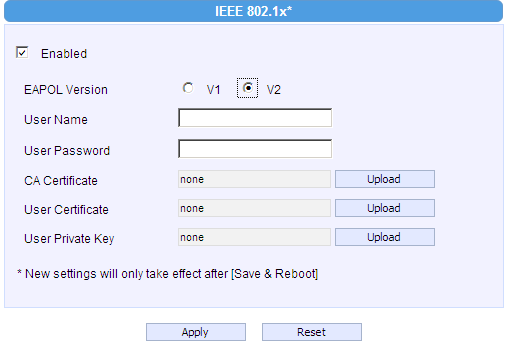 As usually, we begin this section with detecting device booting time meaning an interval between supply power connection on the camera and receiving of the first echo-reply on ICMP protocol. 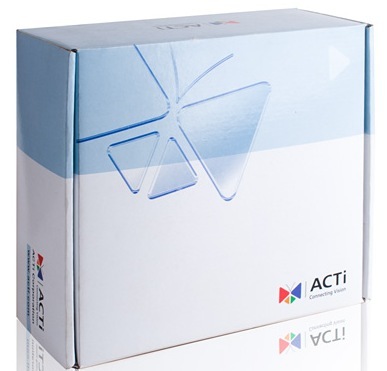 ACTi TCM-5611 boots in 29 seconds and that is a comprehensible value for such devices. 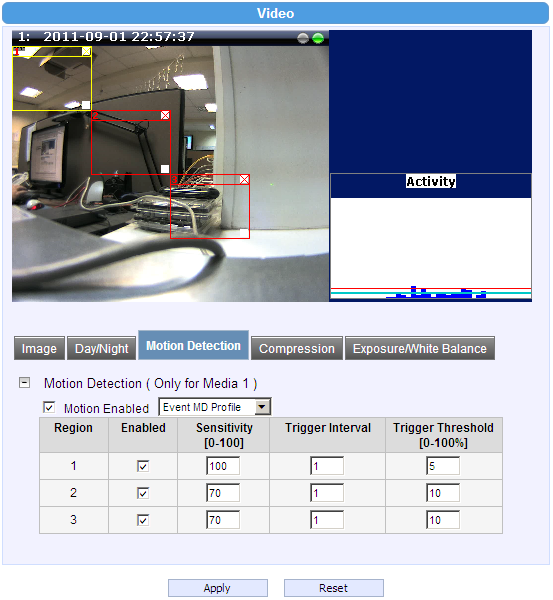 We used Positive Technologies XSpider 7.7 (Demo build 3100) utility to check up security of the camera. The utility found out five open ports: TCP-80 (HTTP), TCP-6001, TCP-6002, TCP-7070 (RTSP), TCP-49152. The most interesting vulnerability see below. Though video surveillance systems are recommended to be installed in separate virtual networks, or to restrict access to them by other means, we consider that vulnerability critical. 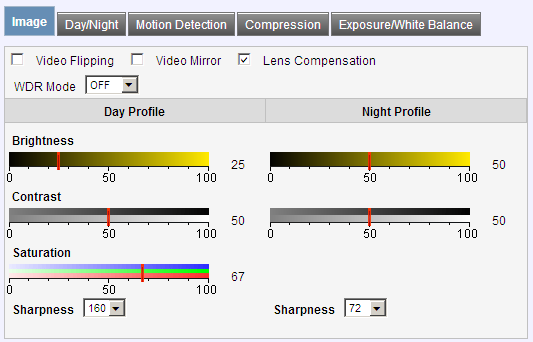 One of important characteristics of the camera is wide dynamic range support. Naturally, we could not avoid such possibility and decided to check up it in practice. For what we directed TCM-5611 at night-time on the ceiling fluorescent lamp and received images with switched on WDR support and without that. 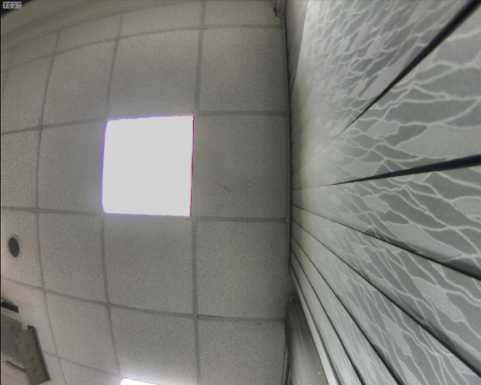 The more light tiles of suspended ceiling received at switching-on WDR function, allowing not losing details in very contrast scenes. 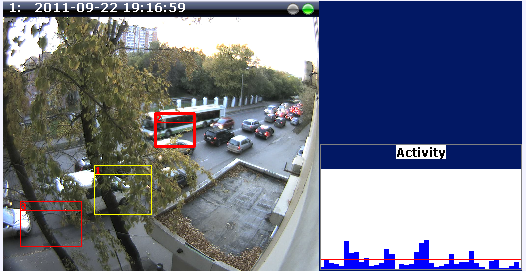 We also decided to check up system of motion detection and configured TCM-5611 on sending video data on the FTP-server (Thecus N8800+ network storage). 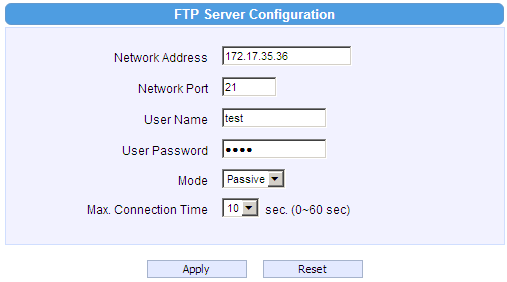 Storage adjustments in this case are extremely simple: we only created the user test and launched FTP-server service. Configuring of the camera is a little more difficult. 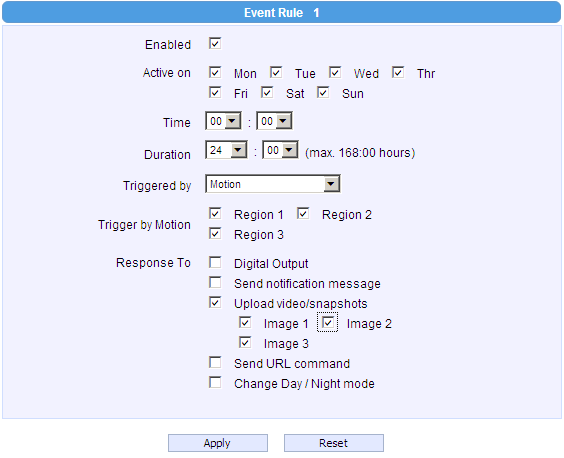 It is necessary to go to 'Video and audio' group, then go to 'Video' tab, then 'Motion detection' tab. Then select up to 3 areas in which will be produced motion analysis. 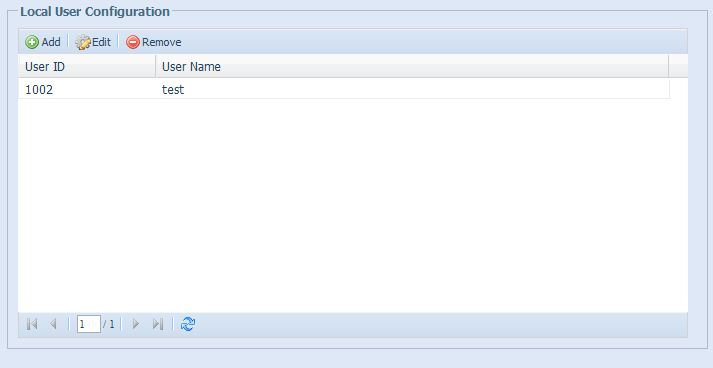 In 'Events server' item of 'Events' group, please, specify FTP-server parameters for loading, and in 'Events setting' item of the same group set photo/video/audio loading parameters to the server. 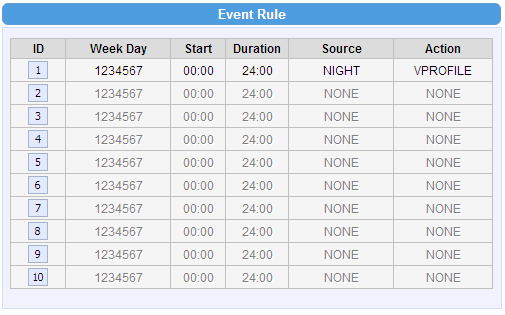 Control of detector operation schedule is made by 'Events list' item. 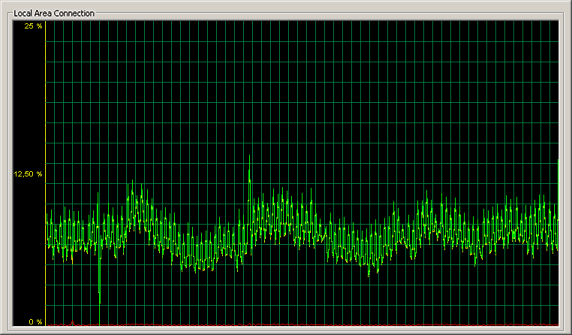 We decided to obtain max values of the network demanded bandwidth. For that we changed number and quality of frames, their resolution and compression. Remarkable, that camera network interface loading directly depends on how intensively move objects in sight of the device (for MPEG4 and H.264 compression). We directed the camera on two-lane road to each side. There was big jam on one side of that road. 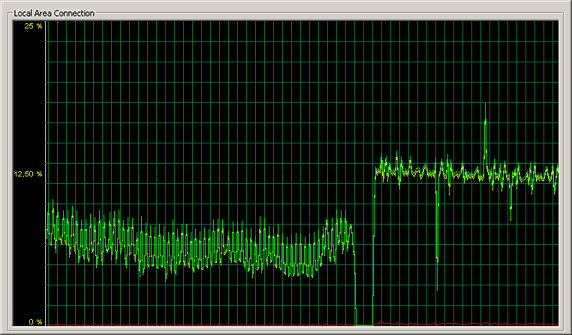 You can see loading of the PC network interface on the graph below. We received the image (MPEG4) from the camera. The transit velocity magnification at the traffic corresponds to those when a stream of contra flow fast-moving cars was on the road. Interface loading variates from 5 Mbps to 9 Mbps. Not the same if you choose MJPEG compression. In this case the network load remained almost constant and made approximately 13 Mbps. 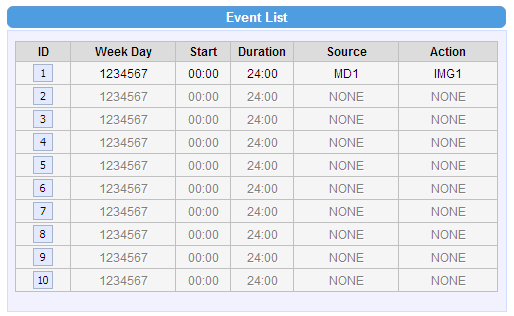 The left part of the schedule corresponds to MPEG4 compression, the right one – MJPEG. It is remarkable, that 'Group of pictures 1 I-shot' parameter has significant influence over the occupied part of a bandwidth. Using out-of-standard adjustments allow the bandwidth reach up to 25 Mbps. 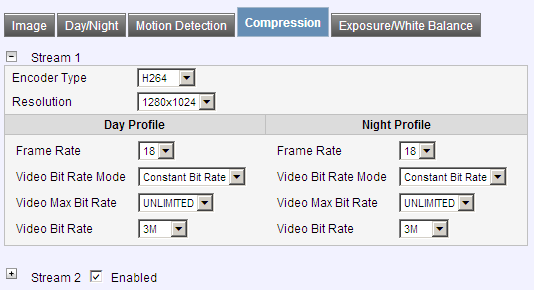 For most used H.264 compression loading of network infrastructure changed depending on speed of scene change in sight of the camera, but normally it did not rise over 7-8 Mbps. Possibility of motion detection also did not stand aside. We adjusted three areas where the system should find out objects motion. As soon as the car got to one of them, the appropriate frame turned to bold. After dark the quality of received picture aloud decreases, but still remains in high level. Tested ACTi TCM-5611 camera looks impressive. For standard usage quite suits lens delivered with the device, however we tested PLEN-0203 model with hand-held focusing and view angle regulation option. In the near future PLEN-0203 lens will be replaced with more modern version – PLEN-0212. 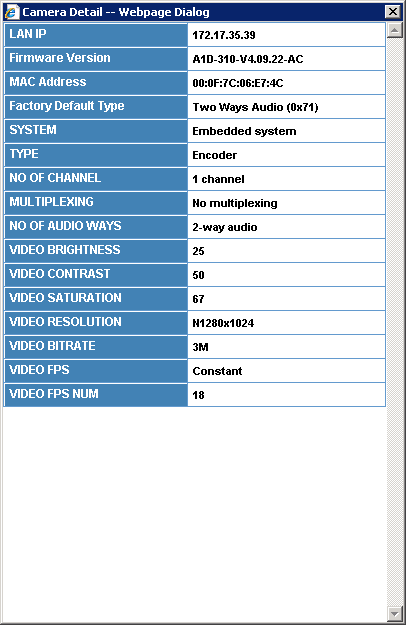 Here are the benefits of ACTi TCM-5611 camera. 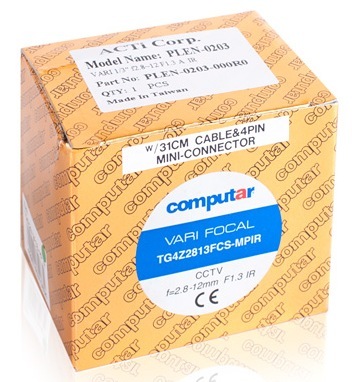 At the moment of article writing the average price on ACTi TCM-5611 in Moscow online shops was 21000 roubles. Special thanks to Tayle Company for the equipment given for testing.